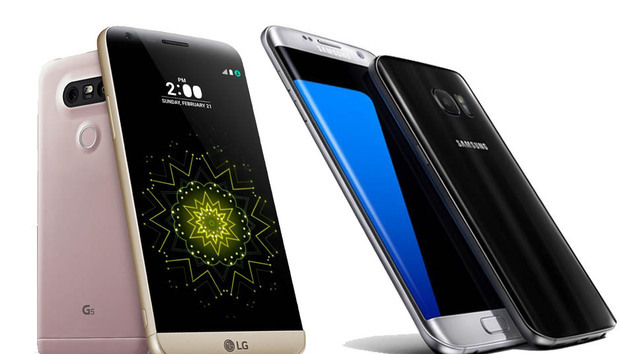 Samsung Galaxy S7 vs. LG G5: Which flagship phone makes a better first impression? The Galaxy S7 and LG G5 were just announced. Obviously, it’s way too early to make any meaningful comparison about the how their quality compares. But since when has that stopped me? Having spent just a little time with each of them, I’ve already formed a few preliminary opinions on how they stack up. Naturally, we’ll have a more fully-formed comparison after they’re released and we can really dig into them. The Galaxy S7 is a refined version of the excellent design from last year’s GS6. It’s sleek, glossy, and a fingerprint magnet. It looks and feels really premium, particularly on the Edge model. It’s hard to find something to complain about. The LG G5 dumped the plastic for metal unibody construction, which was a smart move. The slimmer bezel and rigid metal feels really good in the hand. I don’t think the G5 looks as “fancy” as the GS7, but at least it looks like the kind of thing you’d spend hundreds of dollars on. One small gripe: there’s a bit of a seam where the “chin” at the bottom of the phone meets the body. It doesn’t quite line up perfectly. I don’t know that LG can do the whole “removable battery and add-on components” thing without running into this issue, but it stood out to me. LG’s new phone is a big leap in design over the G4, but it needed to be. Winner: Props to LG for making the G5 look and feel more like the a high-end phone than the G4, but the Galaxy S7 (especially the Edge variant) is still a nicer design. LG decided to plop two cameras on the back of the G5, a 16 megapixel one similar to the camera on the G4, and a new 8 megapixel super wide-angle camera. But they didn’t say they’re doing anything interesting with them. You can basically choose between taking a wide angle or standard photo. The G5 has two cameras on the back: standard and wide-angle. Is that better than a single, higher-quality camera? Samsung’s approach seems better to me: Just worry about making the main camera as good as possible. It’s got a new 12 megapixel sensor that has two photodiodes in each pixel, so every single part of the sensor is used to provide super-fast phase-detect autofocus. Plus, the pixels are big (1.4 microns), and the aperture is very wide (f/1.7). I snapped a few photos and it focuses and focuses and shoots so fast. It will probably be the best smartphone camera ever in low light. Both phones are going to run the Snapdragon 820 with 4 gigs of RAM. They’re likely to be within spitting distance of each other on benchmarks. Real performance will come down to software optimization. Winner: Too early to tell. Both of these phones felt super fast, but the real contest will be discovering which phone still runs well after you use it every day for a few months. Both phones have an always-on display, so it’s worth comparing them. LG still uses an IPS LCD, but only turns on one third of the backlight for the always-on display to save power. Beyond that, it seems fairly basic: you get the time and a few notification icons. Both the Galaxy S7 and LG G5 are capable of showing you time and notification icons constantly, even while the phone is asleep. Samsung’s got an OLED display so lighting up a few pixels to show the time shouldn’t be much of a battery drain. There seem to be more customization options on the Galaxy S7; you can choose from among several different time, calendar, and artwork views. Annoyingly, the info moves around to a different part of the display every few minutes, to avoid OLED burn-in I guess. Winner: This is a great feature on both phones, and the real winner will come down to which phone’s battery drains less with this feature enabled. Since we don’t know that, we give Samsung the win here for giving you more always-on display modes. Both phones now feature microSD card slots. Yay! The LG G5 has a removable battery, which Android fans keep grousing about, but I don’t really want to carry around a spare battery I can only use for one device and then turn my phone off and start it up again to swap it. It makes way more sense to just carry a battery pack that can charge all your gear, and fill up your phone without restarting it. MicroSD cards are back! Both the Galaxy S7 and G5 support expandable storage. But what about the way the G5 lets you snap on hardware modules? How cool is that, right? Personally, I think it’s not going to be a big deal. Consider how they’re used: you can’t just snap on that camera module when you want to take pictures. You gotta pull off the battery cover (this turns the phone off), pop the battery into the camera module (or B&O audio module), put your phone back together, and wait for it to restart. In practice, these hardware modules will be things you put on and leave on for extended periods. The hardware camera buttons and added battery seem great until you realize you can’t just snap it on and start shooting. And I don’t want to leave that bulky thing on my phone. And a high-end audio amplifier on my phone? Just ask Tidal how much people are really willing to pay for audio fidelity. The vast majority of users don’t even have headphones good enough, or ears trained well enough, for a high-end DAC and headphone amp to be a worthwhile purchase. I’m not sold on all these G5 snap-on accessories, in part because you have to pull your battery and restart your phone when you use them. And we don’t even know what these things are going to cost. So I think the jury’s out on the G5’s hardware modules. But the Galaxy S7 is IP68 water resistant, and I think that is going to be vastly more useful to millions of smartphone shoppers. The G5 uses USB-C, which is the future. The Galaxy S7 uses micro-USB, which is the past (but at least that means it still works with the same GearVR that’s already on the market). Winner: Samsung. The ability to wash off your phone and have it survive a drop in the sink is going to do a lot more for most of us. I have no idea what the LG 360 VR is going to cost, but if it’s more than $50, it’s not worth it. It feels incredibly cheap. The resolution is just “okay,” the eye focus is hard to adjust, there’s tons of light leakage, the controls are limited, and it’s about as comfortable and well-made as the 3D glasses they give you at the movie theater. Everything about it feels really cut-rate. The GearVR is only $99 and is already swimming in great content, thanks to the Oculus software partnership. It also provides a much better overall VR experience, despite being bulkier and heavier than the LG unit. The VR experience I got from LG’s new headset was not very impressive. Both LG and Samsung have similar 360-degree cameras. They both use two cameras with really wide-angle lenses, stitching them together to two-dimensional spherical photos or videos. Both support Google Street View. At first blush, the seem more alike than different. It’s all going to come down to camera quality, and I can’t tell yet which one is superior. Winner: I can’t tell who has the better 360-degree camera, but the VR experience from Samsung leaves LG’s headset in the dust. Let’s face it, we just don’t know enough about each of these phones to really know which is better. We have to dive into the design and functions of their respective operating systems, and test the cameras in controlled conditions, and get a sense of the real-world performance. We also need to find out what LG’s accessories will actually cost. At first blush, I’m drawn more to Samsung’s offering. LG gets points for trying to do something new and original, but I remain wholly unconvinced that its modular attachments will be truly useful, while Samsung’s design, waterproofing, and big batteries really appeal to me.